I’ve been having fun getting our outdoor room put together this year. The weather has warmed up and we find ourselves spending time out there most evenings. When I bought the sofa for outside, I decided to go with a neutral cushion. I love the color. It hides dirt and blends in well with the garden, but I thought that the couch could use a bit of pop! I went to look for fabric to make pillows from and was not happy with anything that I found. (You know how you get an idea in your head, then can’t find what you want). Then I remembered a tote bag my daughter bought a couple of years ago. It was this really great sunbleached canvas. I thought that maybe I could recreate the same look with colored canvas. When I bought the canvas it was stiff and icky… (great term huh! )… So I figured out a way to soften it up and bleach it out a bit. (details in the tutorial below). The trick worked and I got the soft sunfaded canvas that I wanted. I ended up making 3 pillows in all. 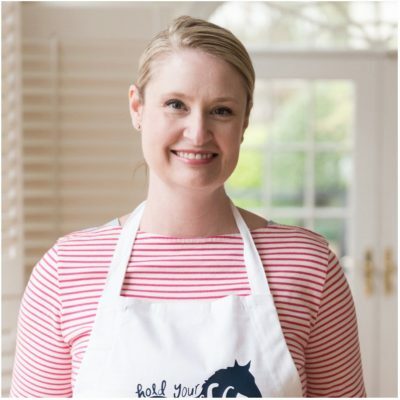 Instructions are included for making the crab pillow – you just follow the same steps for the other two. 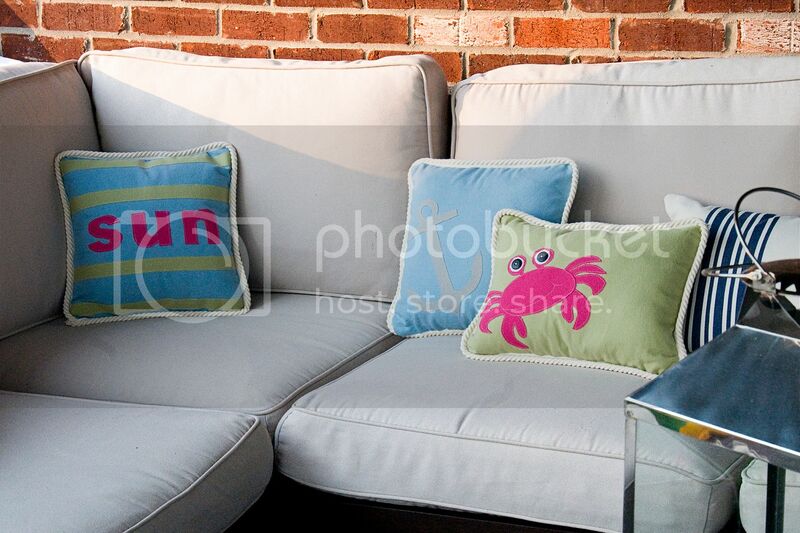 I’m going to leave these pillows outside- it’s a bit of an experiment, we’ll see how they hold up this summer. Yardage of Duck Cloth (yardage depends on size and number of pillows you are making- I bought mine at Joann’s). Wash each color of duck cloth in the washing machine on the highest heat setting. Add fabric softener to the wash. (do NOT wash more that one color of fabric at a time). After it is washed, throw it in the dryer using 2 softener sheets. Repeat if you want it more washed out. 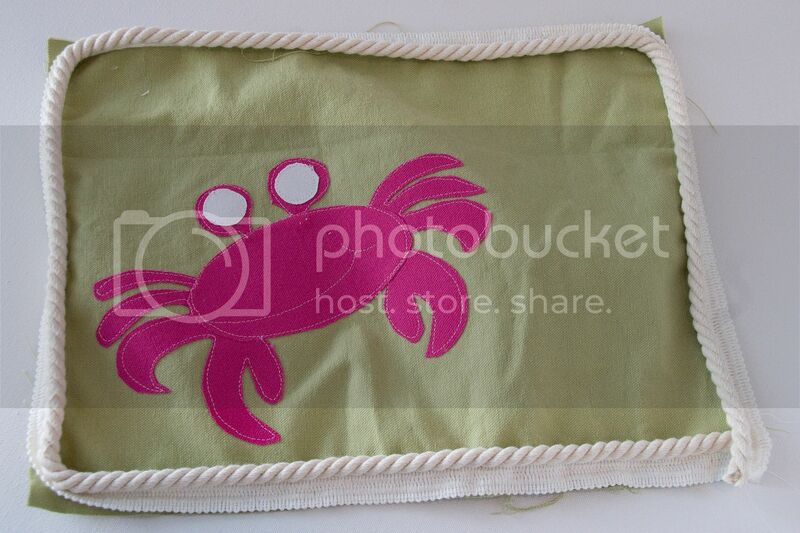 Trace the crab image (found here) onto heat and bond lite. Iron onto pink fabric. Cut out crab. 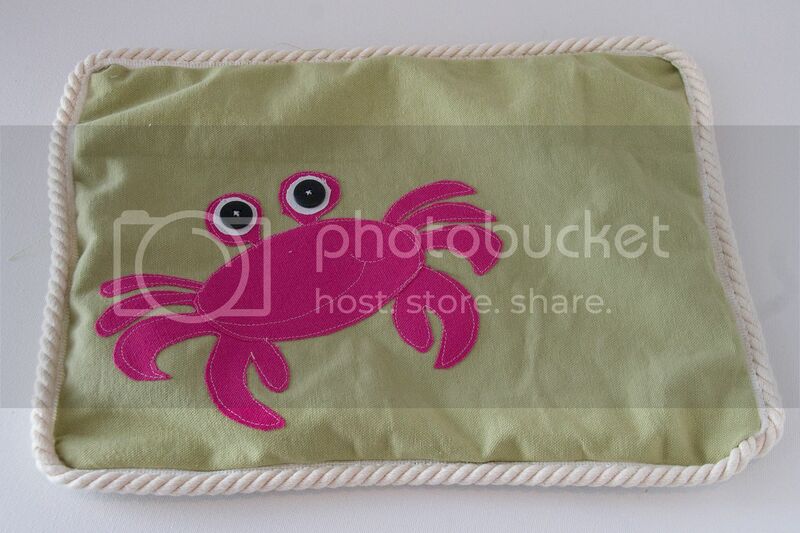 Arrange crab on pillow cover where desired. Remove heat n bond lite backing and press to set. 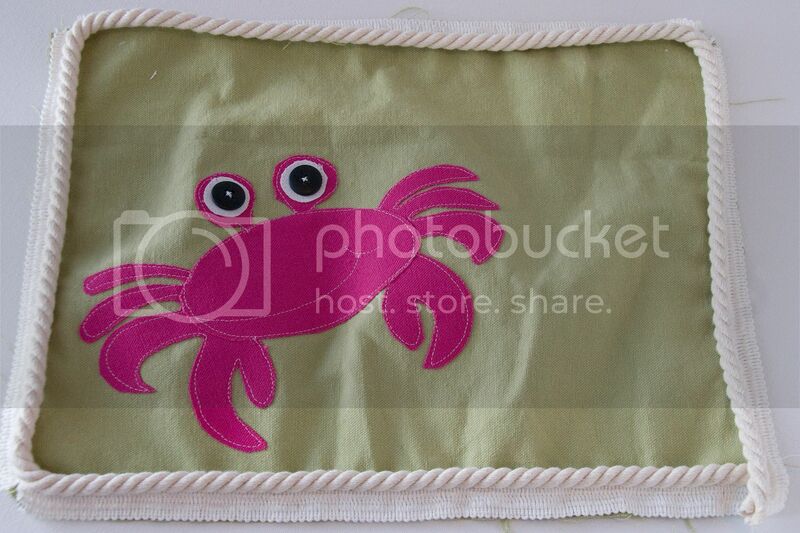 Top stitch around the edge of the crab. Place the cording on the edge of the pillow cover- starting and stopping in a corner. 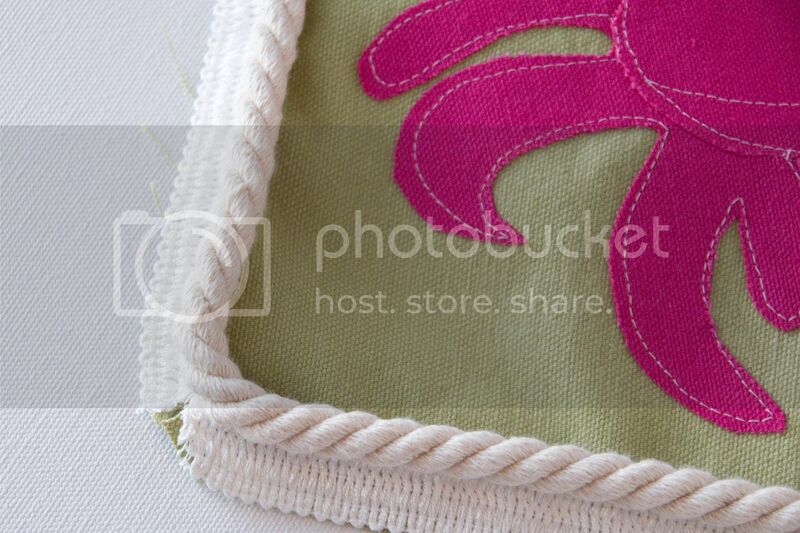 Using your zipper foot, stitch as close to the edge of the cording as possible. Clip the corners of the pillow. This will allow the cording to lie flat round the corner. 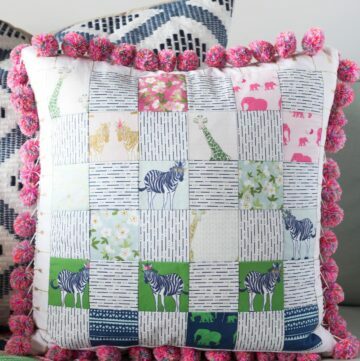 With right sides together, sew pillow cover back to pillow cover front. Just stitch on top of the line you just made for the cording. Leave an opening in the bottom to feed the pillow in. Slide pillow form in and slip stitch closed! 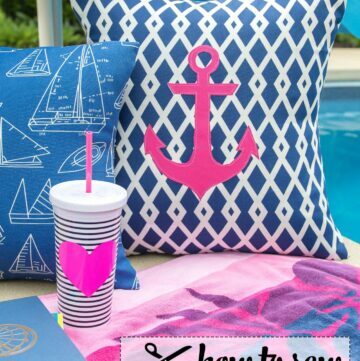 To make the Anchor pillow, I followed the same steps but I used an anchor image from Martha Stewart found here. Have fun making them!! I can think of a few other cute designs, I’ll have to share if I make some. 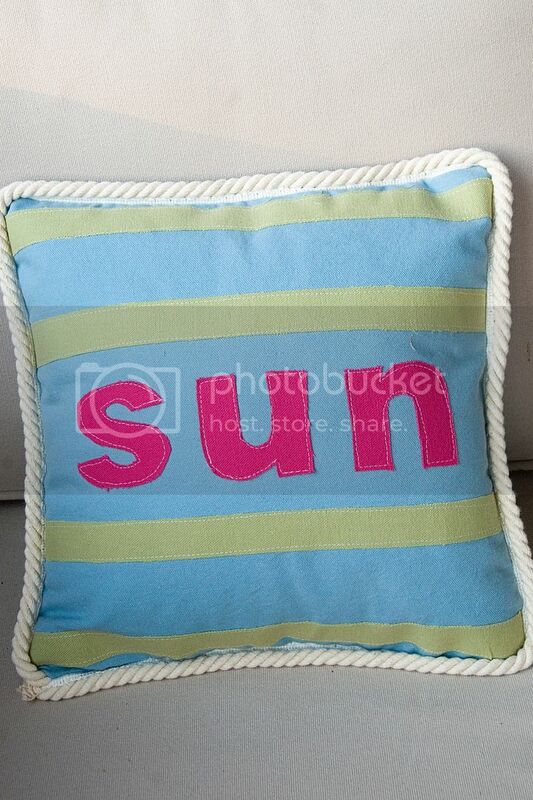 Just a quick post script: These pillows did fade in the sun. If you want them to not fade I would recommend using outdoor fabric. 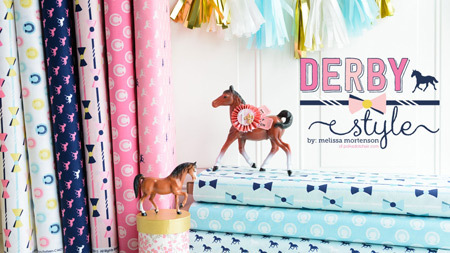 There is loads to pick from at the fabric stores, so you should not have a problem finding any. If the pillows had stayed in the shade all summer and been taken in in the winter they would have been fine. (not faded too much). félicitation c’est très mignon !!!!!!!! ça sent les vacances et le soleil !!!!!!! These are wonderful! 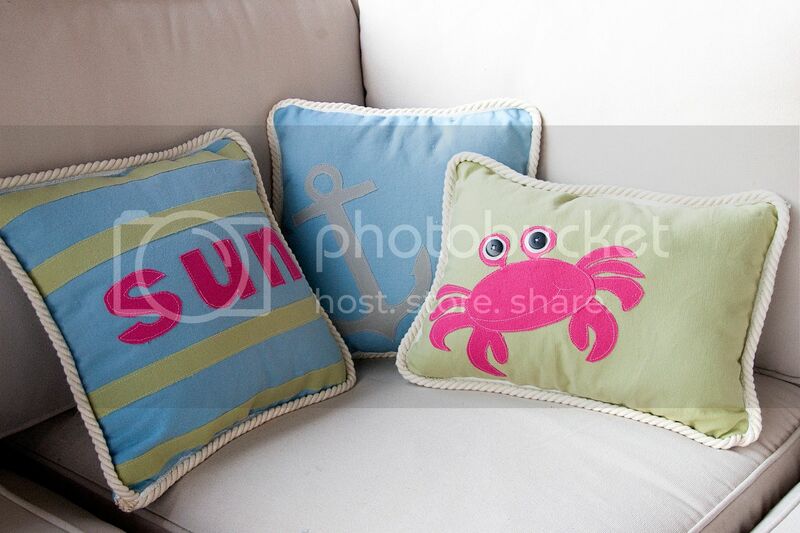 I’ve been meaning to make some beachy themed pillows for my boys, now I have no excuse! Thanks for sharing. Thanks for sharing these, I love them! 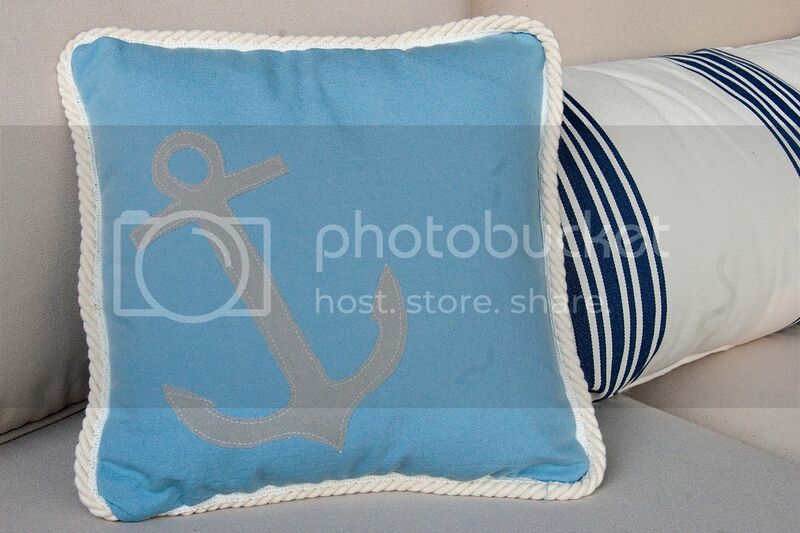 And I was just thinking of making my sister an anchor pillow (she’s obsessed). I’m definitely going to have to try this! 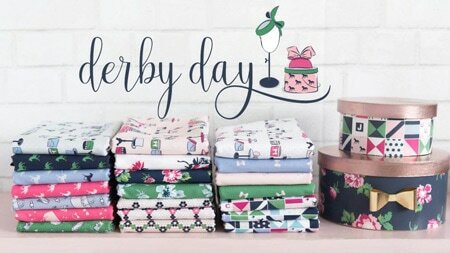 What a great project – thanks so much for the tutorial! 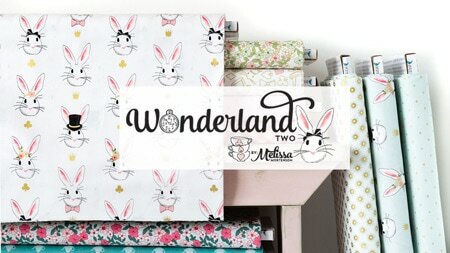 so cute melissa! love that crab! Thank you so much for this post. I want to let you know that I posted a link to your blog in CBH Digital Scrapbooking Freebies, under the Page 5 post on Jun. 15, 2011. Thanks again. The crab design is adorable. I wish I could come hang out on your porch! 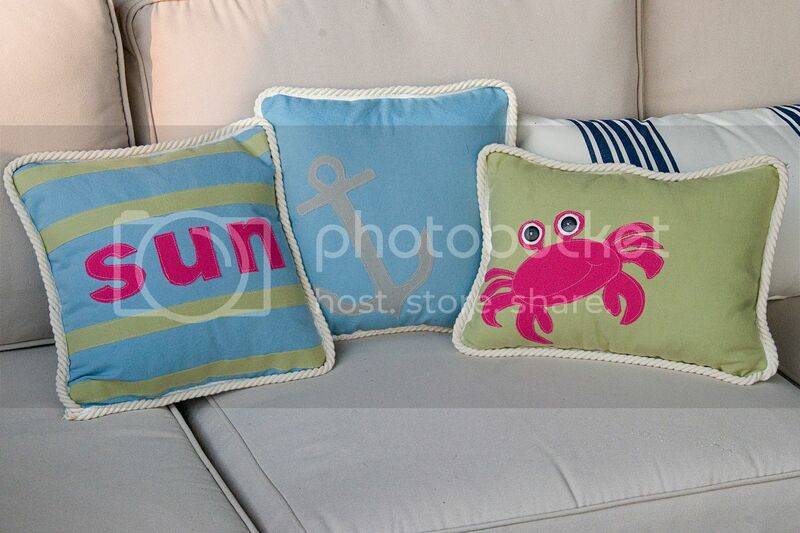 Those pillows are fun and perfect for the outdoors. Thank you for the tutorial! 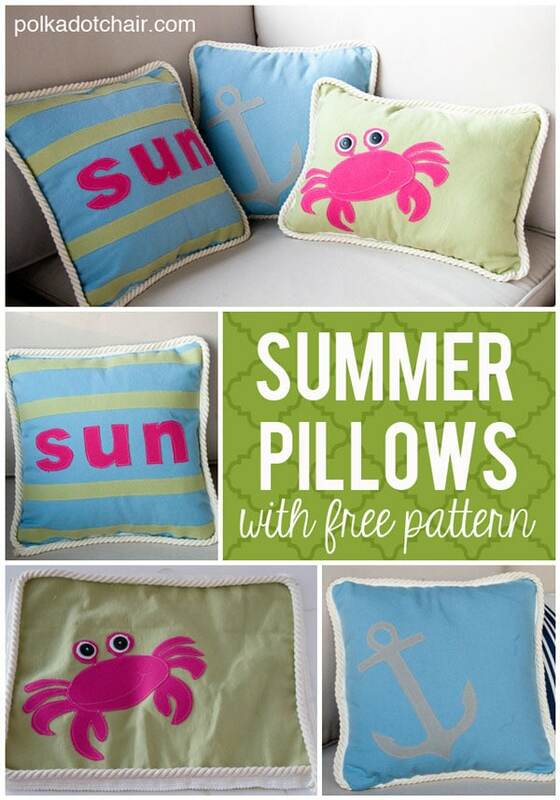 What a great idea and awesome pillows. Thank you. I have to add that I am totally jealous of you for having an area outside that you can put such a great looking couch to relax on. That looks like a great couch to go outside on a nice cool summer night and just relax on. I wanted to let you know that this will be featured on my blog, 6/30. I am telling you now because I will be on vacation. You have been crowned a Diva for Diva Thursday. Come by and grab a button. 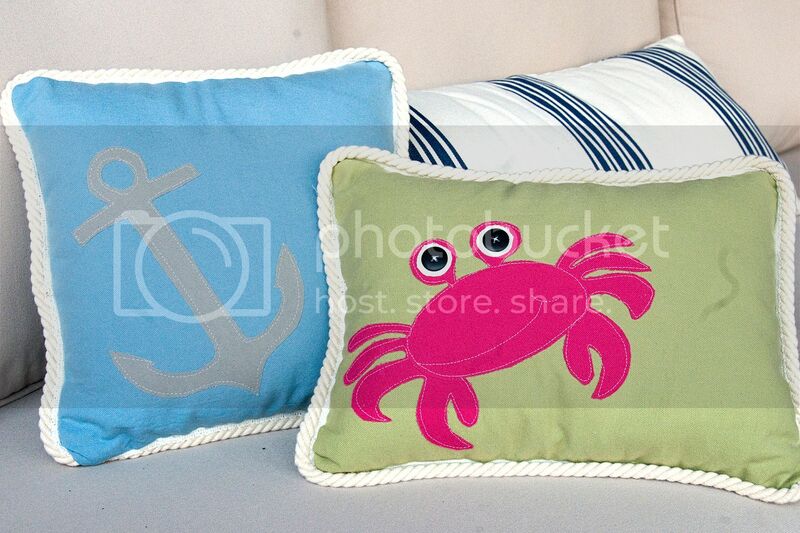 Holy cuteness, that crab pillow pattern is adorable! 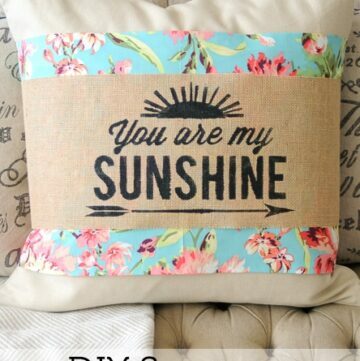 Too bad I can’t stitch if my life depended on it:) Love it! Templates aren’t coming up. Can they be e-mailed to me? 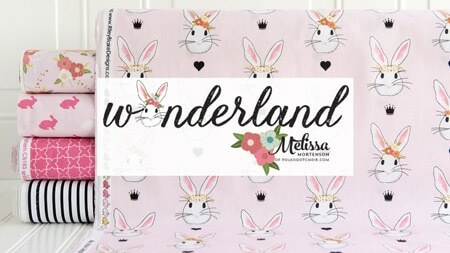 Love this project for my grandson’s bedroom.